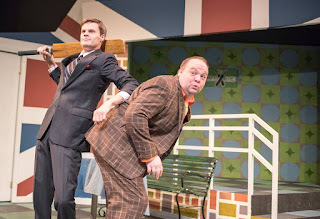 About the Guthrie's 2012 production of The Servant of Two Masters I wrote, "If you don't enjoy the feeling of laughing until your face hurts, you must avoid it at all costs." 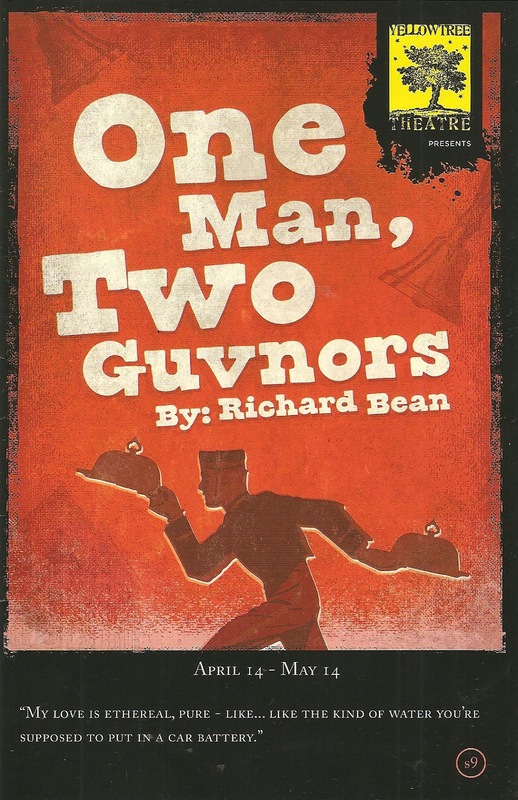 The same goes for Yellow Tree Theatre's production of One Man, Two Guvnors. The 2012 Broadway hit that gave us James Corden is a 21st adaptation of the aforementioned 18th century commedia dell'arte classic. "Commedia dell'arte" is an Italian term which roughly translates as "outrageously wacky fun," which is exactly what One Man, Two Guvnors is. Reminiscent of YTT's 2014 production of the also wacky 39 Steps, which garnered them two Ivey Awards, 1M2G brings back the Ivey-winning director of that show, Anne Byrd, along with half of the Ivey-winning comedy duo, Tristan Tifft. 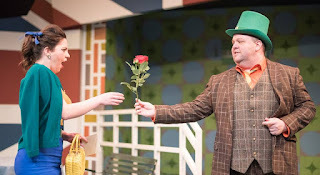 Under Anne's expert direction, this incredibly talented cast (which also includes three of the Four Humors) take the audience on a ridiculously fun ride of crazy antics, physical humor, audience participation, delightful '60s-style music, and much hilarity. Highly recommended for those who don't mind their face hurting from too much laughter. For those of you not fluent in British, "guvnor" means boss, or master. The one man in this case is Francis, a lovable bumbling idiot who's mostly concerned about his next meal. His two "guvnors" are both involved in a recent crime and trying to avoid the cops. Francis is a bit over his head as he tries to keep all of his assigned tasks straight, and keep the two guvnors from finding out about each other. To try to describe the plot would be foolish, suffice it to say we've got mistaken identities, cross-dressing, murders, engagements, mobsters, and long walks off short piers. Did I mention it's 1963 on the southern coast of England? Why? Because the '60s allow for tons of fun in the yummy exaggerated period costumes (by Sarah Bahr) and the set design (by Gabriel Gomez) featuring a larger than life Union Jack on the multi-leveled and multi-doored backdrop (more doors = more funny). 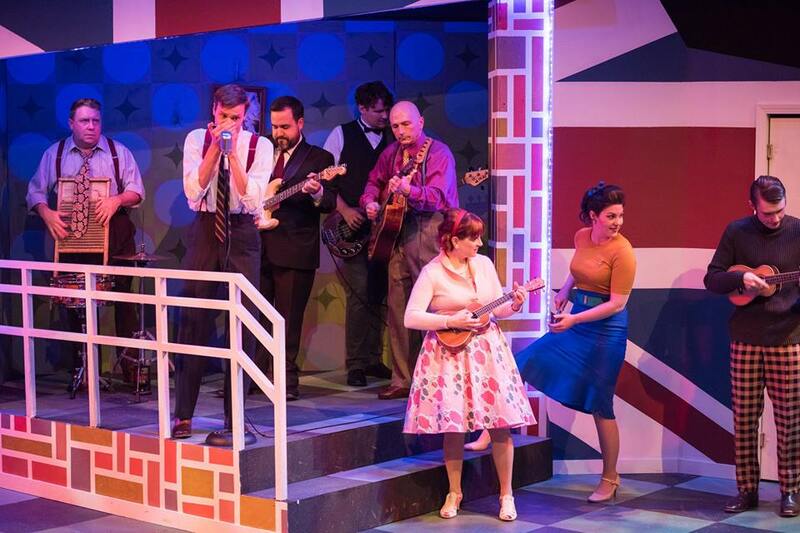 Best of all, the '60s inspired some fantastic original music (by Grant Olding) that may remind you of one or three of your favorite '60s British rockers, all performed by this multi-talented cast. In general, think Austin Powers wackiness and you have a general idea of the design and tone of the show. You can't do this show without a bunch of comedically (and musically) talented actors, and this cast of 11 (or so) fits the bill. 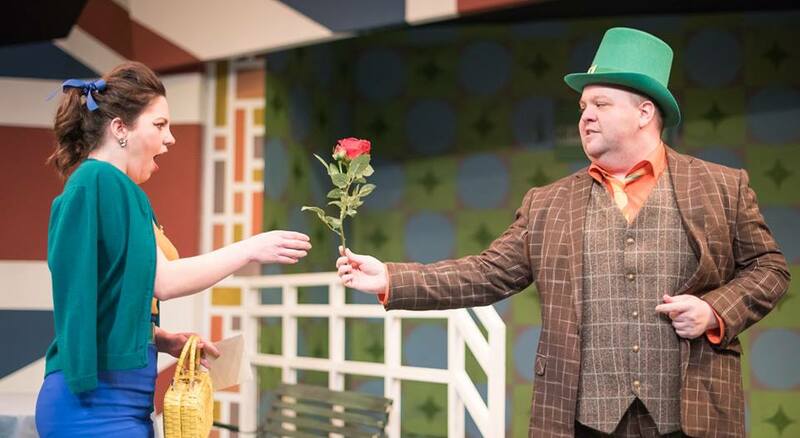 Jason Ballweber, Artistic Director of Four Humors, is brilliant as Francis - playful, disarming, and a master at working a joke and engaging the audience (note: when you ask the audience questions, be prepared for them to answer, and he is!). Another of the Four Humors, Ryan Lear, plays one of the guvnors, Stanley, and some of the highlights are watching the two of them together as they milk every moment for as many laughs as possible (this show is supposed to run 2:20, but was closer to 3 hours when I saw it, because laughing). More wonderful people in the cast (many of whom pull double duty as multiple characters, some only onstage for a moment) are: Marika Proctor, a delight as the other guvnor, Stanley's girlfriend Rachel in disguise as her dead brother Roscoe; the hilarious Elise Langer as the dim-witted bride to be, all innocent blinks and big expressions; Sam Landman as her gum-chomping gangster father who breaks down every time he mentions his absent wife; Neal Skoy as the overly dramatic actor boyfriend; Tristan Tifft with some incredibly physical comedy as a really old waiter; Elena Glass as the sweet-singing mobster's secretary; Peter Simmons as the disgruntled father of the groom and a busy waiter; Warren C. Bowles as an ex-con; and the third of the Four Humors, Brant Miller, singing and playing guitar in all the musical numbers. This cast plays and works so well together and is obviously having a blast, which only makes it more fun for the audience. There is much fourth-wall breaking in the script and in their performances. It's the kind of show where when unexpected things happen (wardrobe malfunction, audience comment), or the cast almost cracks each other up (as happened several times), it's even more fun for the audience. The tone is incredibly loose and playful, even though the actors are entirely prepared and professional, which creates a really wonderful and therapeutic experience of being in a room with 100-odd people and laughing together, sharing the joy of expertly written and executed comedy. Now in their 9th season and with a loyal fan base, Yellow Tree Theatre tends to sell out their comedies. For that reason, One Man, Two Guvnors has been extended through May 21. Get your ticket before they're all gone! Unless you're averse to laughing for 2+ hours straight, then by all means, stay out of Osseo until the danger has passed.